It is a traditional Japanese taiko drumming style that has become known through works of a taiko group "Kodo", and is formally called "Miyake-jima Kamitsuki Mikoshi Daiko". The word 'Miyake' comes from Miyake-jima which is an island of the Izu Island chain and located at 180km south of Tokyo. This web site is maintained by 'Miyake-Jima Geino Doushi-Kai' which is an organization for promorting and preserving Miyake Taiko. 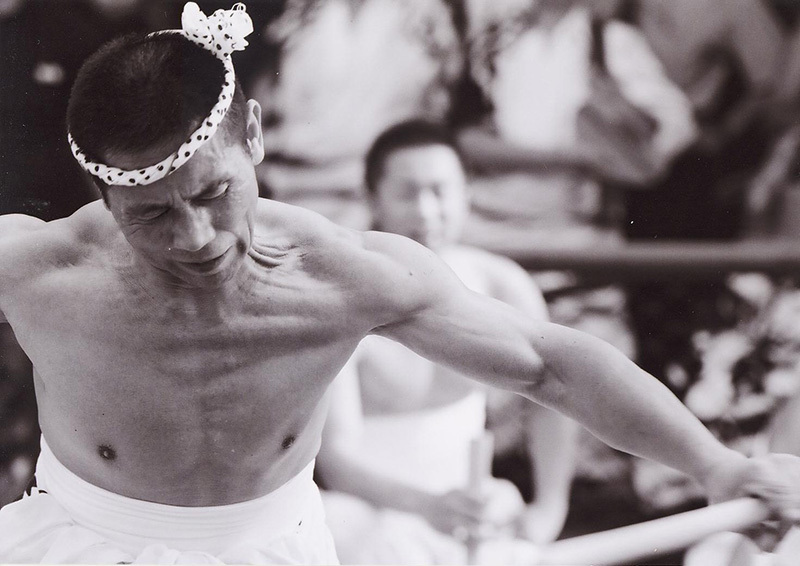 The organization is founded by Akio Tsumura who comes from Miyake-jima and taught Kodo the style of Miyake Taiko. The style of Miyake Taiko has developed as a music for Gozu Tenno Sai --a traditional festival held on July in Miyake-jima since 1820. In this festival, they keep playing Miyake Taiko from 11:00 a.m. to 8:00 p.m. to lead their mikoshi portable shrines going around their town. Akio Tsumura had also played for the festival before Miyake-jima erupted in 2000. After he evacuated from the island, he arranged the original music into a form suitable for musical performance. Basically, the sound of Miyake Taiko is composed of only 3 straightforward rhythm patterns so that it does not require any muscial scores. And also, it is distiguished from other taiko styles by its quick and powerful beat. 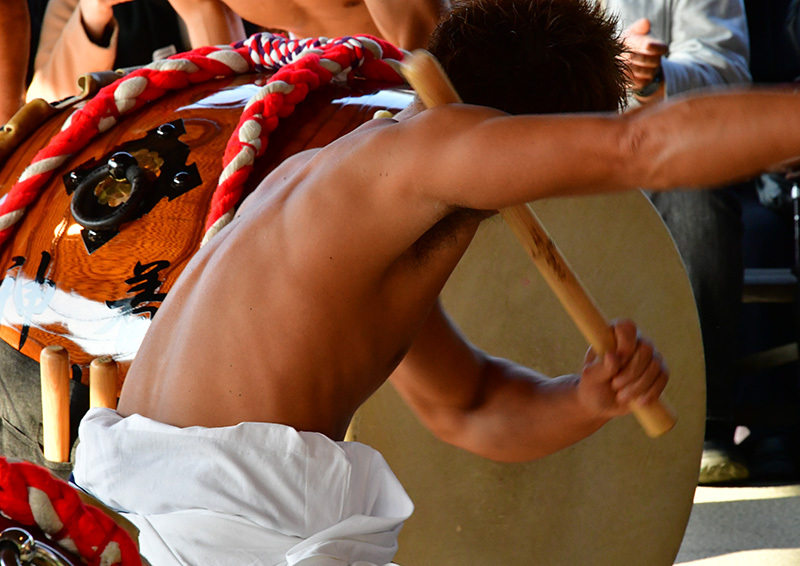 The intensity of the beat is described that the heads of drums used for Miyake Taiko must be changed once a year though those used for other taiko styles usually changed once in every 10 years. 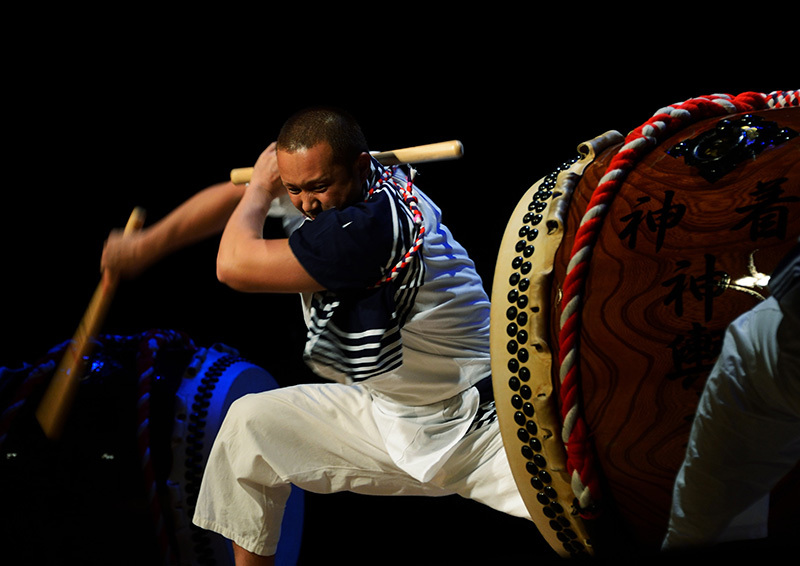 Through the years as a festival music, these two aspects have grown into the powerful and exciting groove of Miyake Taiko nowadays. You will find the performers of Miyake Taiko quite unique in their postures when you see them playing. They kneels down to the level of the drum put on the ground and beats it from both sides moving their whole body. Mr. Akio Tsumura has combined some constituent elements of Gozu Tenno Sai such as "Uchikomi Daiko", "Kagura", "Kiyari", "Shishimai" and "Hyottoko", then rearranged them into a form suitable for a drum-oriented musical performance. It is still composed of three basic rhythms but variety of embelishments in tempo and tone are added to entertain audiences. 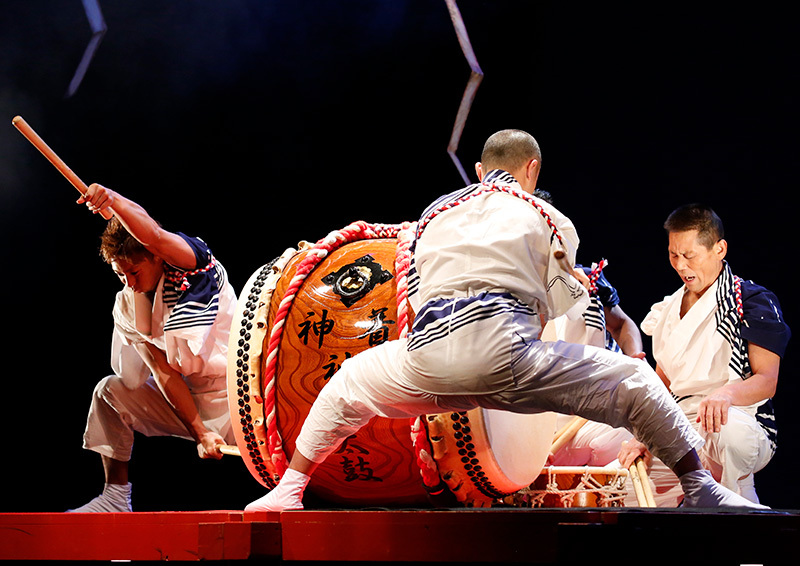 The drumstics and the taiko drums used for Miyake Taiko are from 49 to 51 centimeters(about 20 inches) and from "shaku shichi" to "ni shaku" in diameter, respectively. Lastly, the sound of Miyake Taiko vibrates our body as well as our eardrums. Its boom sound comes directly into out body and reverberates. Therefore, Akio Tsumura emphasizes the importance of a image as if he was injecting the sound of taiko drum into years of audience when he coaches his students.